Another rainy day which had started out so well but didn’t last and I’m plodding my way towards Ballingup. Over the past few days I have had the Donnelly River area described to me as the ‘roller coaster’ and today I find out why. After leaving Gregory Brook campsite I head off on a relatively easy terrain as I head towards Millstream Dam. I’m in my own world and was startled by a wild pig, the only one I’ve seen so far – I quickly look around for piglets just in case she decides to get upset. Luckily she’s alone and after making a disgruntled sound shoots off into the bush. As I head down from the dam on management road the rain starts to settle back in and becomes quite heavy. I don’t mind the rain itself but given I’m walking through steep valleys, the low lying areas are becoming inundated from both today’s and yesterday’s weather. I thought I had left walking through water back in the Pingerup Plains but again I’m presented with two long wide puddles that I have no choice but to walk through. I had been warned about ‘cardiac hill’ in this section as your make your way up to Blackwood campsite and given it was pouring with rain I just put my head down and keep on going. I’m glad I’m going up this hill as it would have been a knee killer on the way down and very slippery. 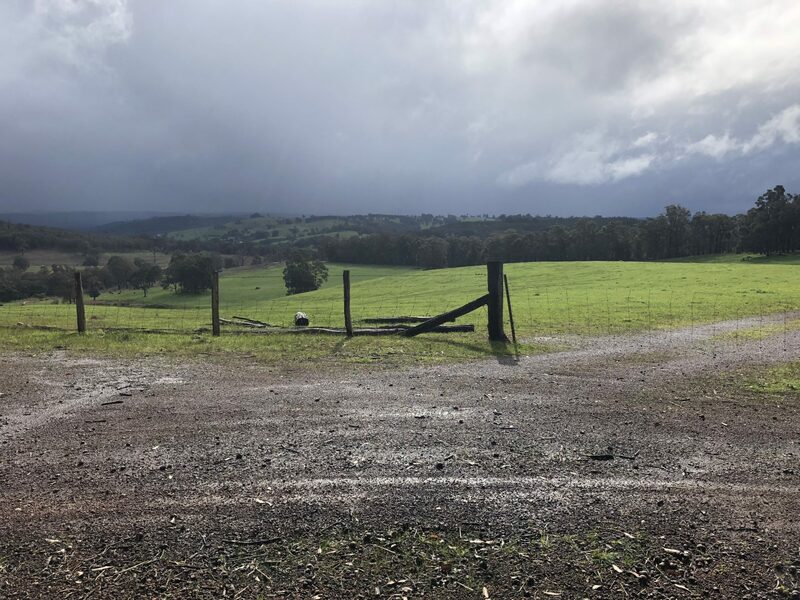 I get to Blackwood and while this campsite has the potential to be spectacular providing some awesome video ideas to wake up to from your bed across the neigbouring valley, it also has the potential to be a nightmare. I arrived before midday and had a quick lunch as well as tending to my wet abused feet while the freezing wind and rain blows accross the front of the shelter. I’m getting cold just sitting there and it would only take a slight wind change to blow straight into the shelter, making for a miserable night. 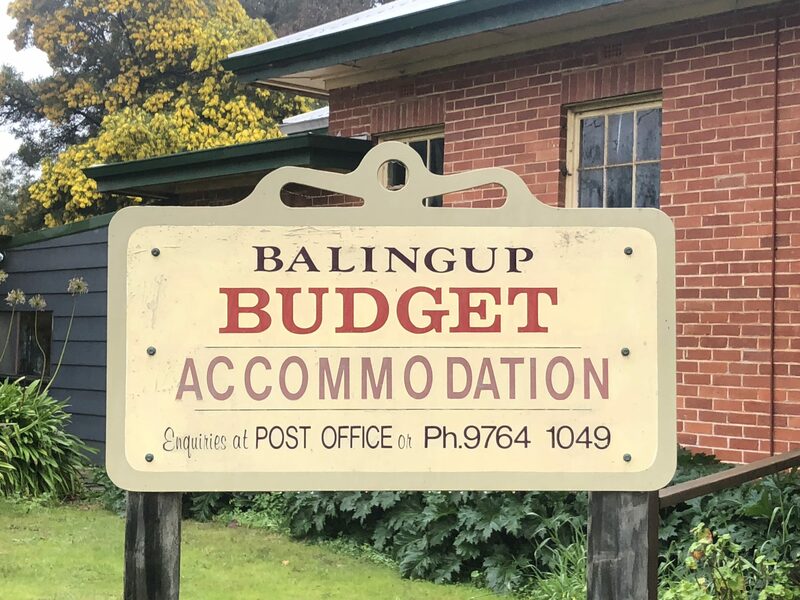 I press on to Balingup and arrive at the Post Office (which also does accomodation) just before 5pm. I’m looking forward to a warm shower and a pub meal but am disappointed to discover that due to the medevial festival on the previous weekend, the pub is closed so I make do with a freeze dried meal. The Post Office is basic but good value even when a fuse blows late in the evening leaving us with power but no light. There are other hikers staying here tonight including a solo male who is testing things out for a thru-hike next year. There’s also a family with two young boys who are doing this section and coping well with the 20km+ days. This overnight stop was unplanned as I’m 1/2 day ahead of schedule on this section and had planned on having lunch here rather than overnighting.